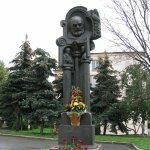 — The Monument to Taras Shevchenko – was installed in 1939 in the park named after Shevchenko opposite the main building of Kyiv National University (sculptor – Matviy Manizer). 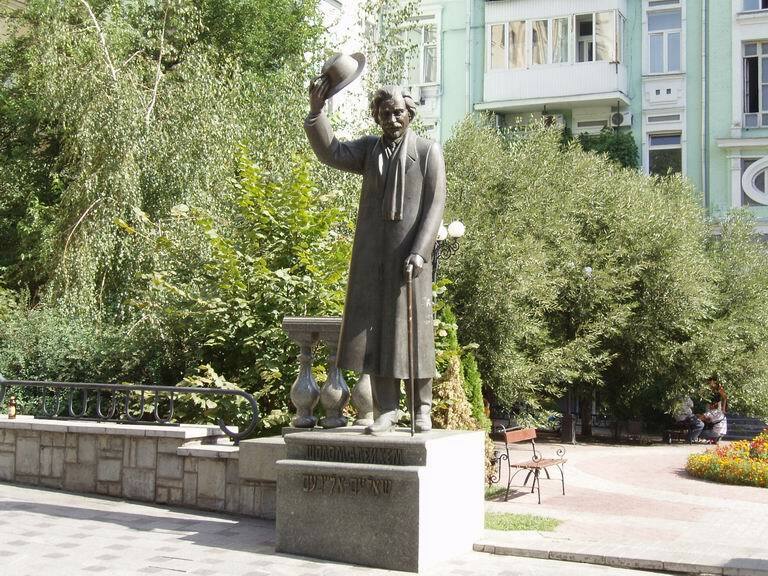 The monument to Shevchenko is one of the symbols of Kyiv. The monument often hosts various social and cultural events and an annual ceremony of the People’s Shevchenko Prize. 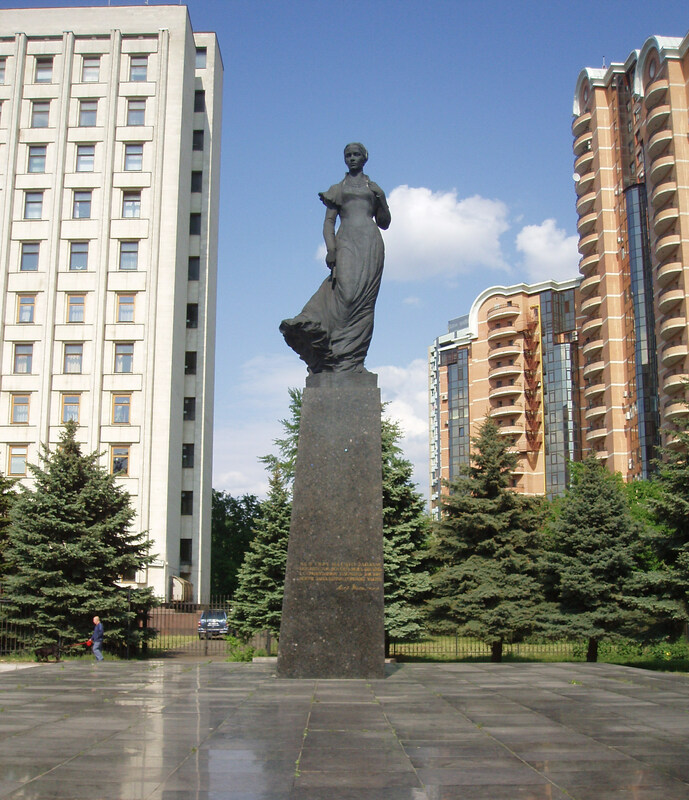 — The Monument to Lesia Ukrainka – was placed in 1973 in Pechersk district on the Lesia Ukrainka Square (sculptor – G. Kalchenko). 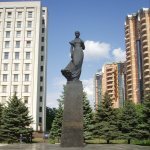 The monument is a bronze figure of the poetess standing on the pedestal of black labradorite with the engraved lines from the poem by Lesia Ukrainka. The monument is surrounded by trees specially brought from the motherland of the poetess. – The monument to Sholom Aleichem – was installed on the Rognedynska Str., 3 in honour of the famous Jewish writer. In a narrow coat and with a cane Sholom-Aleichem greets every passer-by, holding his hat high above his head. 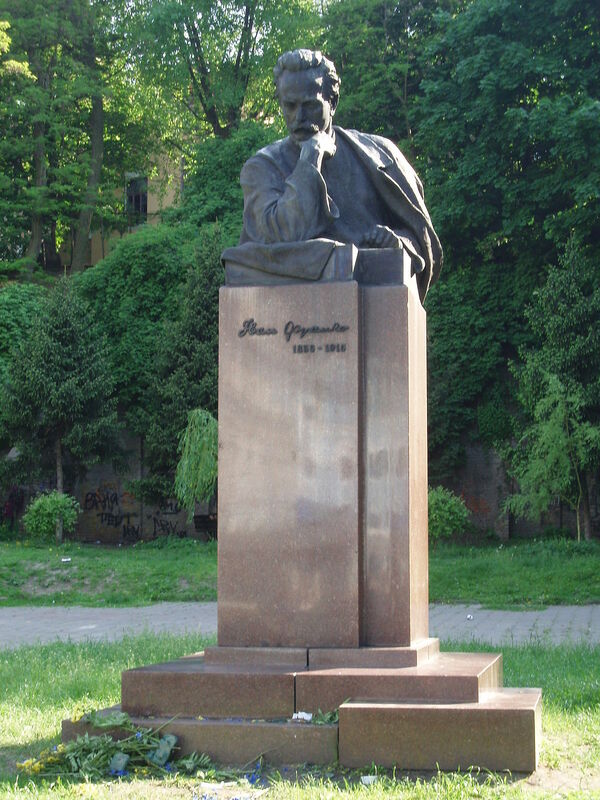 The monument of the writer stands on two steps, on which his name is written in Ukrainian and in Yiddish. 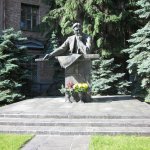 Not far from the monument on the Velyka Vasylkivska, 5 there is a museum dedicated to the creative work and life of Sholom Aleichem in Kyiv. At this address the writer lived in 1896 -1903. This was the time of his active creative activity. Here he wrote “Menachem Mendl”, “In a small world of small people”, some short stories from “Tevye the Milkman”. 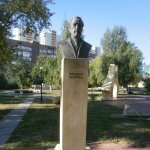 — The Monument to Ivan Franko – the monument to an outstanding writer and public figure was placed in 1956 in a park near the National Theater named after Franko (sculptors – O. Suprun, A. Bilostocki). The monument is a bronze bust of the writer on the pedestal made of red granite. 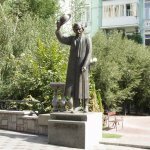 — The Monument to Mikhail Bulgakov – the monument to the world-famous writer, the author of the novel “Master and Margarita” was installed on the Andriivskyi Descent in 2007 (sculptor – N. Rapay). The monument is a figure of the writer, pensively sitting on a bench. 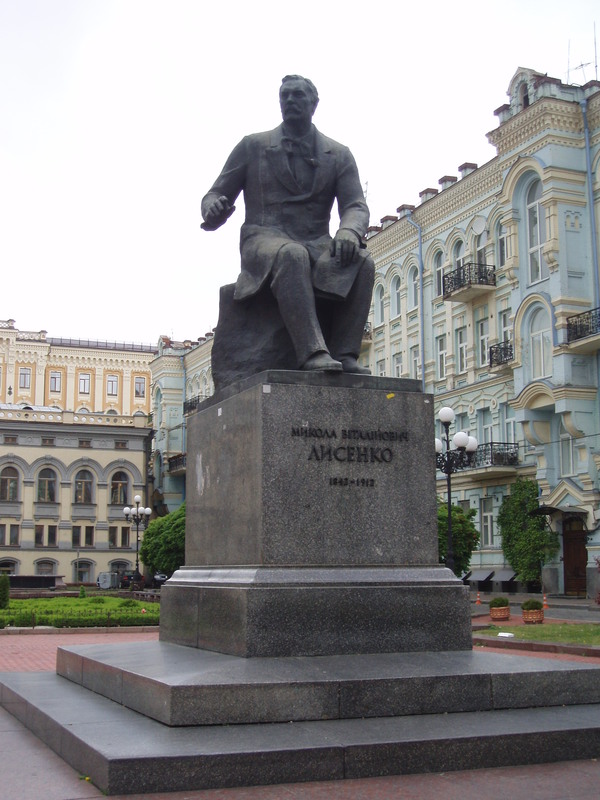 The monument is located at the Bulgakov house-museum where the writer lived and worked. 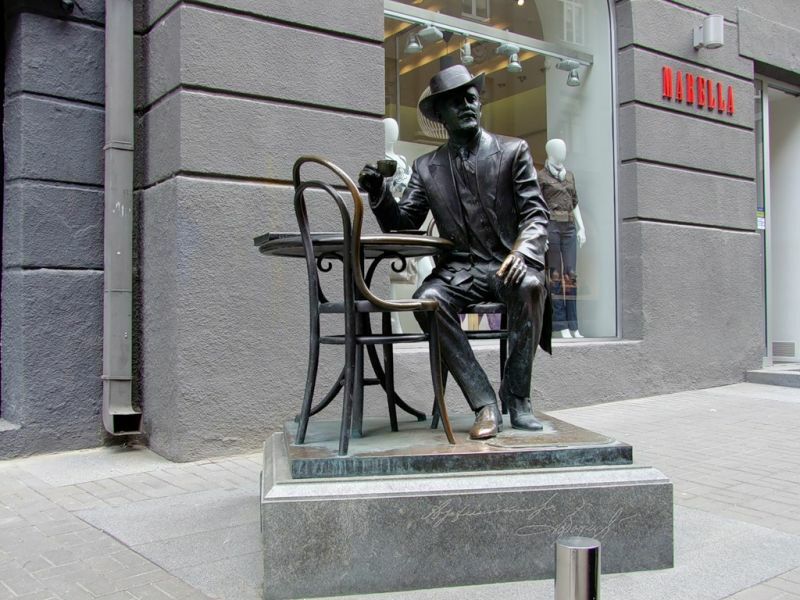 — The Monument to Wladyslaw Horodecki – the monument to the famous Kyiv architect was installed in 2004 in the Passage (sculptors – V.Shchur, V.Sivko). 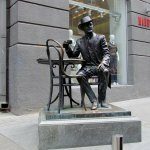 The sculptural composition is a bronze figure of the architect sitting at a table of the street cafe with a cup in his hand. Everyone can sit down at the table and make a memorable photo with Horodecki. 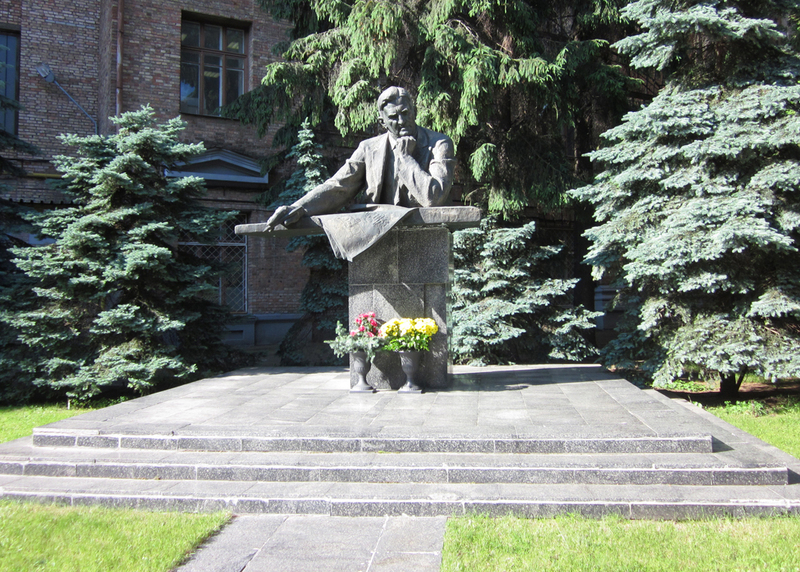 — The Monument to Nikolay Lysenko – a Ukrainian composer and founder of the national classical music school. It was established in 1965 on the Teatralna Square, near the National Opera House (sculptor – A. Kovaliov). 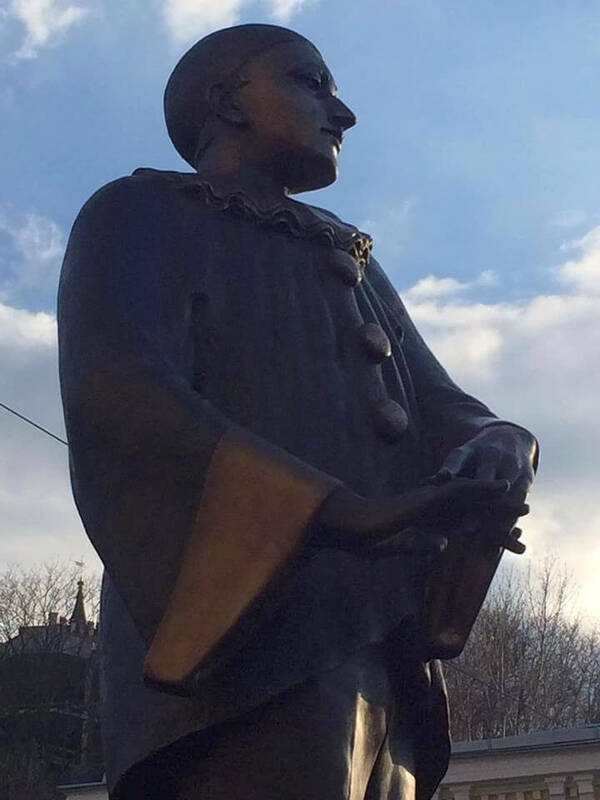 The monument is a sitting figure of the composer with his hand raised suggesting the conductor’s gesture. 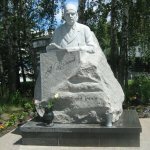 — The Monument to Alexandr Vertinsky – the monument to the famous artist was established in 2019 at the corner of Andriivsky Descent and Borychev Tik (sculptor – B. Dovhan). The monument is a bronze figure of an artist in full growth on a marble pedestal. Vertinsky depicted in the image of Piero. — The Monument to Sergei Parajanov – an internationally renowned film director, was established in 1997 on the territory of the Dovzhenko film studio (sculptor – B. Mazur). The monument is a bronze sculptural composition on the rectangular pedestal. In the center, there is a relief portrait of Paradzhanov, while the arched niches depict Ivan and Marichka (main characters of the movie “Shadows of Forgotten Ancestors”), as well as characters from the movies “The Pomegranate Color” and “Ashik Kerib”. 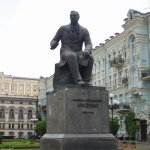 — The Monument to Anatoliy Solovianenko – the world’s famous tenor, – was established in 2001 on the Institutska street, near the house, where the singer lived more than twenty years (by sculptor N. Rapay). The monument is a full height bronze figure of an opera singer. — The Monument to Igor Sikorsky – an outstanding aircraft designer of the 20th century, was installed on the territory of NTUU “KPI” in 2008 (by sculptor M. Oliinyk). The monument depicts a full height bronze figure. Sikorsky is wearing a raincoat and has a hat in his hand. He is standing with his gaze fixed into the distance. 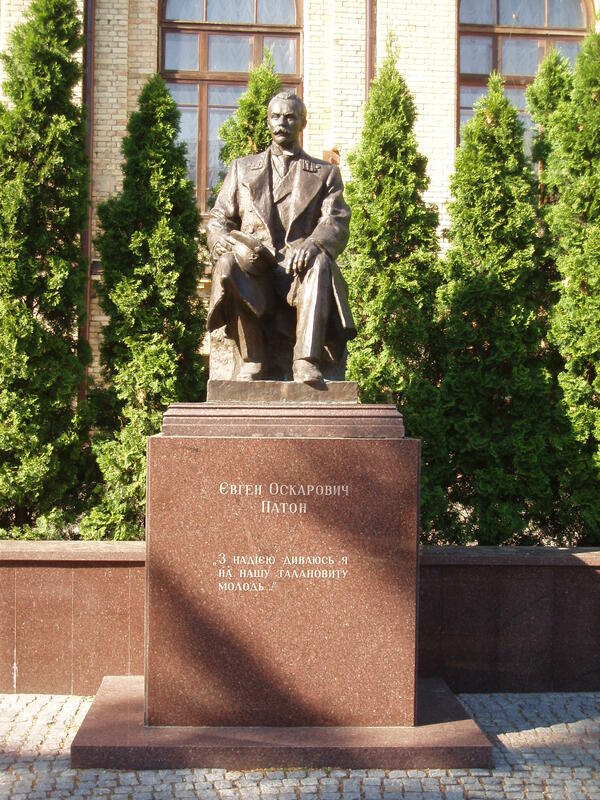 The pedestal has got the following inscription: “To the designer of the first aircraft, helicopters, KPI student during 1907 – 1911 from the Kyiv Polytechnics”. 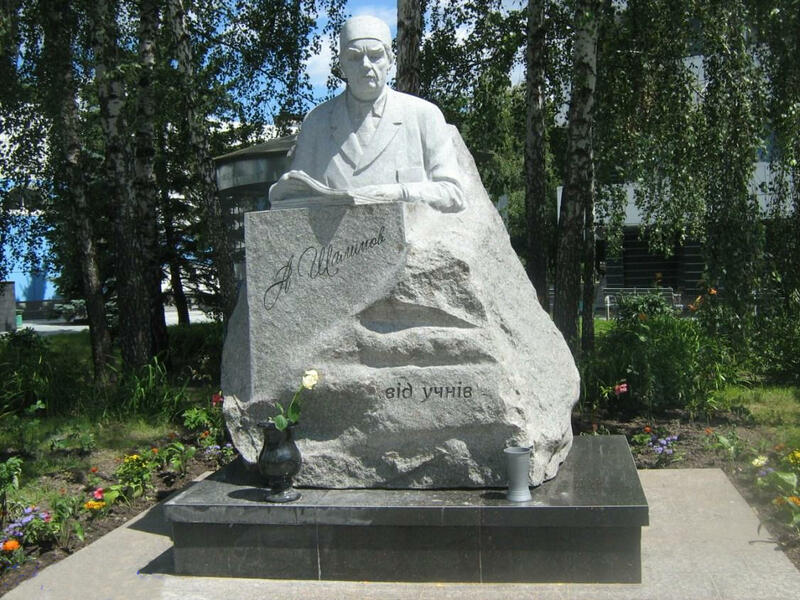 — The Monument to Eugeny Paton – a famous engineer and scientist, was established in 2002 on the territory of NTUU “KPI” opposite the Polytechnic Museum (by sculptor A. Skoblikov). The monument is a sitting figure of Paton on the pedestal with the words of the scientist on it: “I’m hopeful about our talented youth …”. 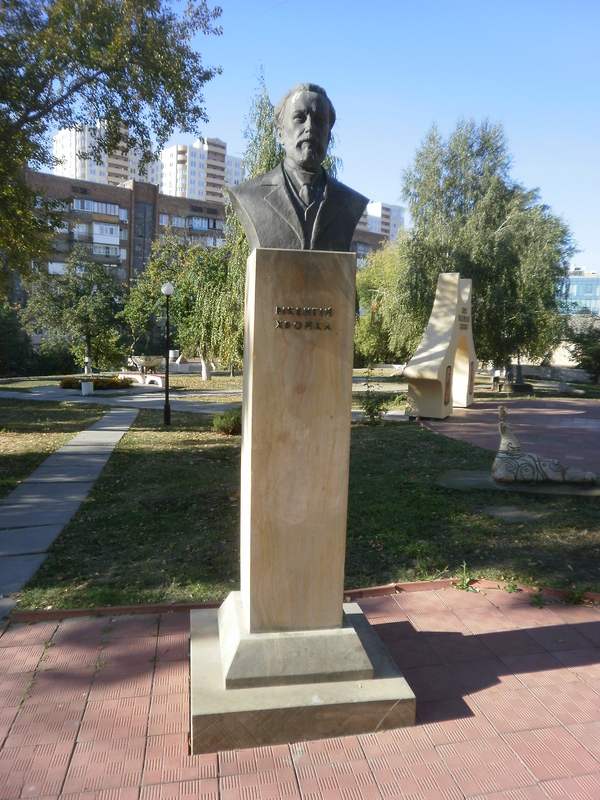 — The Monument to Vikentiy Khvoyka – a well-known archaeologist who discovered the Trypillian culture in Ukraine, – was stablished in 2004 in the IAPM Park of Trypillian culture (by sculptor P. Glemyaz). It is a bronze bust of an archaeologist, erected on the pedestal with the inscription. — The Monument to Oleg Antonov – a well-known aircraft manufacturer, was installed on the territory of GE “ANTONOV” (by sculptor A. Shatalov). 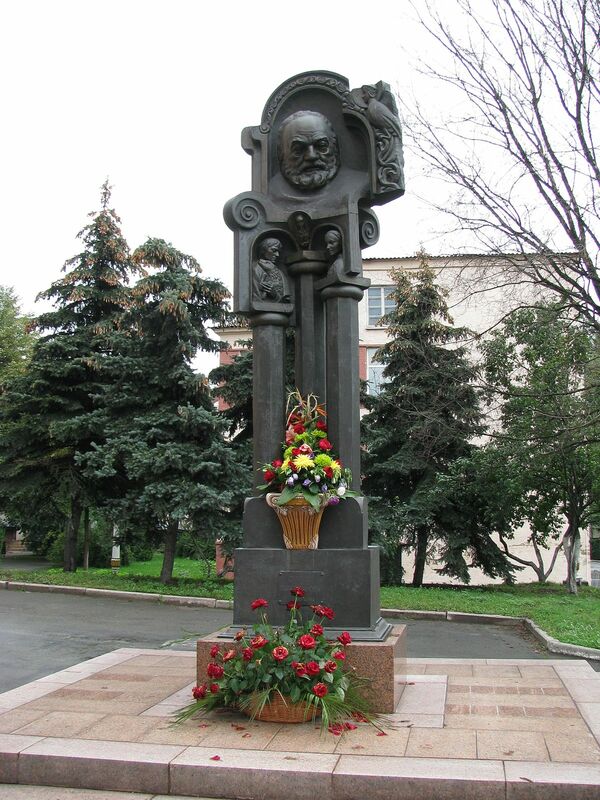 The monument is a figure of Antonov, thoughtfully bent over the drawing. 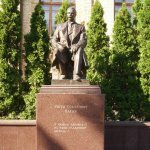 — The Monument to Alexandr Shalimov – a legendary surgeon, was installed at the central entrance to the National Institute of Surgery and Transplantology (bt sculptors A. Ruban, V. Lypovka). An outstanding physician was portrayed in a granite monument, bent over the magazines in his office.